I’m excited about today’s post because it is a pretty storage solution that is also practical and most of all, SAFE! I’m working with the American Cleaning Institute (ACI) to spread the word on the importance of laundry room safety and today's post is important for anyone who has children at home and has laundry, which is pretty much one in the same! As a mom of three kids, I love cute spaces, but my number one priority is keeping my kids out of harm’s way. Luckily, I can have BOTH! These bins are just one example. However, I totally understand that not everyone wants to look at that original packaging. Many people move their detergent packs or even liquid detergents and fabric softeners into new containers. But doing this means the hazard warnings and ingredient lists are no longer available. Many brands even use kid-resistant packaging, which is an added level of protection. By getting rid of the packaging, you also lose that benefit. In 2016, through June 30, poison centers received reports of 6,429 exposures to highly concentrated packets of laundry detergent by children 5 and younger. My goal is to prevent this from ever happening to my kids (or anyone other parent who reads this blog)! My solution of keeping a decorative laundry room, while leaving the product in its original container is a great alternative. And as a perk.. it only cost me $1! Yep, the bins I’ve repurposed are just from dollar store. They fit the entire package of laundry packs without a problem, while still fitting inside my cabinets. It is really just as simple as spraying the brightly colored bins to make them look like old metal bins. You could use sharpie to write on the tags, or like I did, cut out some vinyl labels on your Silhouette or Cricut machine. Tie them and VOILA! Perfect storage. I put my fabric softener sheets (still in the package) and my concentrated detergent packs (also in the packaging) right inside and put them up high in a cabinet above my washing machine. If you children were older or if you had a household of all adults, you could set them on the counter. But keeping the detergent in the original packaging is still just as important. 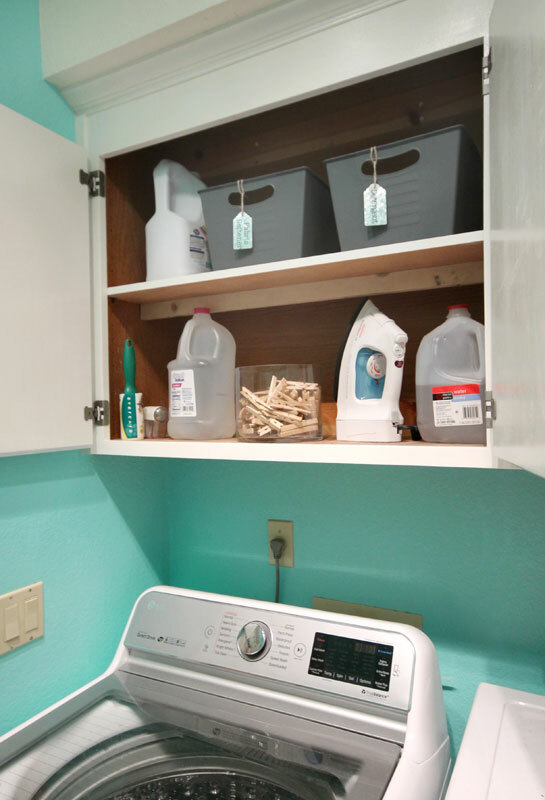 There is no need to sacrifice safety to have a cute laundry room! Pledge to keep your laundry room safe by taking ACI’sKEY Pledge! You’ll be entered to win a $2,500 gift card for a laundry room makeover!